I found a great article, School as Inquiry, by Steven Wolk in the October 2008 issue of Phi Delta Kappan. The article matched some thinking and presenting that I have recently been doing. I’ve examined this as the struggle between being focused on teaching and being focused on learning. 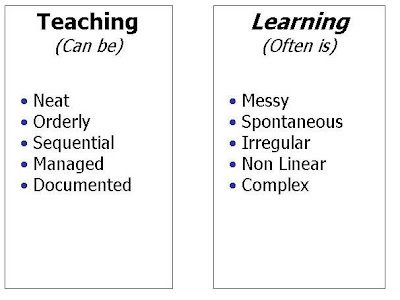 The biggest change that has occurred in my work with coaching over the last 15 years is an increased focus on observing the learner vs the teacher and studying the teacher’s choices as they impact the learners’ choices. Wolk has a great statement that captured the observation of the learner for me. I’d suggest that school administrators, coaches, and staff developers could voice a similar goal; we consider our work a failure if teachers do not leave our conferences, conversations, and workshops filled with questions and the yearning to explore them. I suggest that the coach works from inside this circle, asking questions and providing input that increase a teacher’s observations (often the coach sees, hears, and feels, things not obvious to the teachers). Coaching questions and conversations increase teachers’ thinking (inquiry) that generate a desire to produce or create an idea. 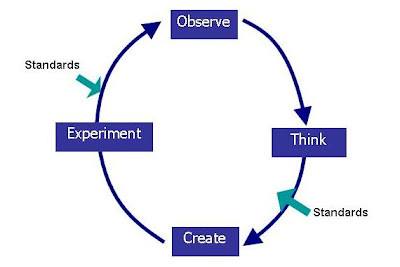 When teachers engage their students in a learning activity, they are experimenting, then identifying if the activity is producing the learning requires observation and thinking, which leads to the teacher’s next decision. As instructional leaders, we need to be “teaching” in ways that cause our staffs, our students, and ourselves to be living a culture of inquiry. Stephen, I thank you for the many times I have been honored to witness you living out this belief in promoting inquiry. Each time I attend a session facilitated by you, I leave bubbling over with new ideas, fresh perspective, and plans for shifts in my own consulting, facilitating, and coaching practice. Thanks! Your comments made my day! I believe that my use of inquiry is motivated by teachers like you who are anxious to learning and willing to share.